Get cash for your junk car in Pennsylvania today! We are Pennsylvania's top junk car and truck buyer. We provide the fastest cash for junk car service in Pennsylvania. Is there a more patriotic state in the USA than Pennsylvania? As one of the original thirteen colonies, it is quite literally the birthplace of our great nation. In 1776 our founding fathers signed the Declaration of Independence in Philadelphia and created the freest and most powerful nation the world had ever seen. If you’re ready to declare independence from that old junk car you have sitting around in your driveway, it’s time to call The Clunker Junker. We pay cash for cars in Pennsylvania and pick up more cars in the state than any other junk car buyer, period. We buy cars, trucks, vans, and SUVs in all conditions from complete junkers and clunkers to well taken care of used cars. As long as the vehicle is complete, we’ll make an instant offer on it right on our website. Just answer a few short yes or no question and you’ll be off to the races! From Philly to the Poconos to Pittsburgh, Pennsylvanians trust The Clunker Junker when they want to sell a junk car in Pennsylvania. That’s because we pay top dollar for junk cars, and provide the very best customer service in the industry. In fact, we are so proud of our reviews and reputations, we strongly encourage you to check them out. We’re not always perfect, but when things go wrong we always make things right one way or another. Other junk car buyers hide their reviews and make it difficult to research them, but we wear our reputation like a badge of honor. Whether you spend your new cash infusion on some Cheese steaks or tailgating at a Steelers game, one thing is for sure: You won’t have to worry about that ugly old car ever again! There are no hidden fees for towing the car or any other service. We want to make sure it’s fast, easy, and free. If you’re looking to get the best value for your junk car in Pennsylvania, The Clunker Junker is here to help. It’s easy to sell your junk car through us. We work with a number of junkyards throughout The Keystone State to provide you with the best possible estimate. When you’re ready to sell your car, you can start by using our online tool. Enter your make, model, year, and trim into the system to start the process. We’ll then ask for information about the condition of the car. It doesn’t have to start for us to make an offer on it, but it’s something we need to know to provide you with an accurate quote. We’ll also ask for the mileage. If you don’t have the title on hand, let us know right away. We can sometimes still buy the car, but it’ll affect the quote. Occasionally, we’ll ask for more information about the car. For newer vehicles, it’s not uncommon for us to want pictures to verify condition or ownership. However, once we have all the information we need, you’ll have a quote in your hands in seconds. By working with auto salvage yards across Pennsylvania, we’re able to provide you with the best quote available for your junk car. Unfortunately, we aren’t able to buy every car submitted to us. However, you’ll know quickly whether or not it’s worth something, and you’ll rest assured you’ve gotten the top dollar for your junk car. No matter the condition of the car, once you’ve accepted the quote, we’ll arrange for a date and time to pick it up. We’ll gather the rest of the important information from you – address, VIN, vehicle color – and then send a PA junk car buyer to pick it up. We can pick up most vehicles within 48 business hours of providing a quote. One of our drivers will come out to you, do a cursory inspection of the vehicle, and then provide you with your cash or check. How much can you sell a junk car for in Pennsylvania? Every car we look at is unique, but there are common factors we take into account when offering quotes. These are the main things we look at when going to buy a car. When you think “junk car,” this is it. These are the real eyesores in the back of the driveway somewhere that look like they saw better days many years ago. Clunkers like this are often just recycled for basic raw materials and you can expect to see anywhere between $50 to $200 for a vehicle like this. We’re still in junk car territory here, but cars in this category often have valuable parts that can be extracted and used elsewhere. Once the parts are out, the car is crushed up into scrap metal. These in-betweeners typically yield a little more cash than pure junk. Our name doesn’t mean we don’t buy all kinds of cars in Pennsylvania. In fact, in many cases, we can offer more than local junkyards can. Depending on the condition and the type of car you’re selling, you’ll see anywhere from $200 to $10,000 for cars in this category. To find out more about what your car is worth, use our online tool for an instant quote. Required: The state of Pennsylvania requires that all titles are signed in front of a notary public! 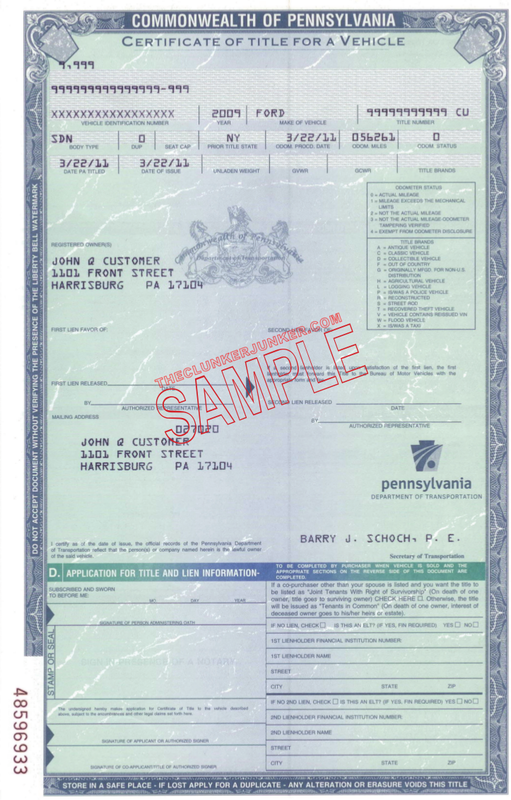 We have put together a simple guide and example for how to sign your Pennsylvania title when you are selling your vehicle. If there are multiple owners listed on the title, they must all sign the title unless the names are separated with "OR". Find the "Assignment of title" section on the back of your PA title, that's where you'll want to sign, print, and have the notary stamp. Ignore any section that says "Reassignment by registered dealer", you won't be needing that. First sign the back of the title where indicated by "Signature of Seller". This may need to be done in front of a legal notary. Always sign in pen on the seller line and never sign in the dealer section. Print (don't sign) your name on the back of the title where it reads "Seller and/or Co-Seller Must Handprint Name Here". Always include any and all middle names or initials that are used in the owner section. 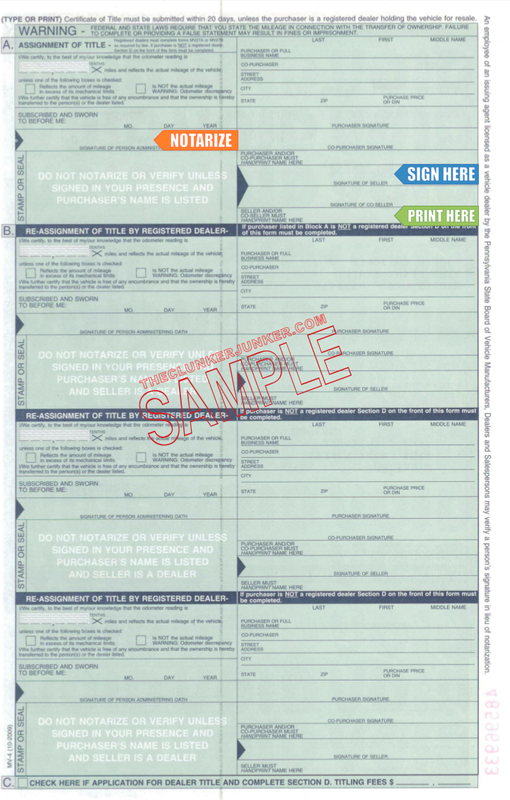 Make sure your notary signs and stamps the title in the notary section. 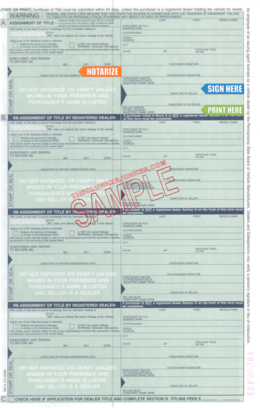 Fill out the Pennsylvania Application for Duplicate Certificate of Title by Owner. Please note that there may be a waiting period before a duplicate title can be issued and the cost is $22.50. (Paid to the PA division of motor vehicles). Getting rid of an abandoned vehicle in Pennsylvania can be a difficult process. Unfortunately, you cannot just sell any junk car that ends up on your property if you do not own it. You'll need to follow the Pennsylvania abandoned vehicle removal procedures. We have given a general overview of what that entails below. To have an abandoned vehicle removed from your private property, you may first contact your local law enforcement office. They will use up to (5) five days to investigate the abandoned vehicle. If the vehicle is confirmed abandoned, law enforcement will dispatch a tow truck to remove the vehicle. The tower responsible for the vehicle has (60) sixty days to locate and contact the last registered owner of the vehicle. If no owner and/or lienholder expresses interest, the vehicle will be sold at public auction. If you would like to apply for the title to the vehicle, you must enlist the assistance of an attorney and acquire a court order to claim ownership of the abandoned vehicle. Do you buy cars without title in Pennsylvania? Yup! We buy many cars without title. That doesn’t mean we can buy every car submitted to us, but many of our PA buyers are willing to make offers with no title. They will ask you to prove ownership, however. You’ll need a photo identification that matches your insurance card and or registration. Also, don’t be surprised if your offer is a bit lower without title. What if my title doesn’t look like the one pictured? 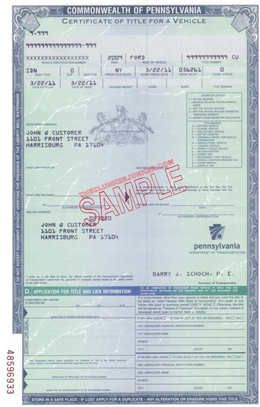 Pennsylvania often changes their title documents from year to year. If you have questions about your specific title, please contact your Pennsylvania DOT. Do I need to turn in my license plates? Yes, unless you are transferring the plates to a new vehicle. You can return the plates to your local DOT office. What should I do about my auto insurance? You will need to notify your auto insurance company that you have sold the vehicle so they can either cancel your policy if the vehicle was sold, or transfer/renew the policy on your new vehicle. Is there anything else I need to do? You may need to notify your local DOT that you have sold the vehicle. You can contact them with any additional questions or concerns about the transfer of your title. It’s easy to sell your junk car for cash with The Clunker Junker. Our online tool makes getting a quote quickly a snap. There’s no obligation to sell once you get a quote. Find out how much your junk car is worth today! "The car runs well. The engine is very quiet, and everything works fine. Everything on the car is up to date. I just do not need a big vehicle. The engine, transmission and everything start right up. I have a smaller car now." "The vehicle has no A/C, the carpet is stained, the clear coat is peeling off on the roof, and there are some cigarette burns from the previous owner. The battery is one year old, it has great tires, and it will start and run. However, sometimes after turning it off, it will take forever to start again. I don't need it." "The vehicle runs well, but it needs work. It would need to be towed, as the brake line no longer works. My local mechanic says there's also an issue with the fuel line (rust - the lines need to be replaced), and the check engine light won't turn off. The horn also doesn't work. I have replaced the entire muffler and the radiator within the last year. The interior is in great condition with a working CD player. The registration tags are current. The odometer reads 207,567 miles. " "I recently had to replace the radiator and compressor. Once that was completed, they told me that I would also need a motor. In the last year, I have replaced/fixed a number of items, and I just can't afford to pay any more cash for repairs. I am just trying to get it off of my insurance and out of my parking space. " "I'm junking the vehicle because it has a bad motor. I started to pull the motor for a swap and lost motivation. Now, I don't feel like doing it and don't have time anymore." "The vehicle is missing multiple interior pieces, but it has the seats and most of the major stuff. There's no engine or transmission and no wheels on the vehicle. All of the body panels are there except for one fender, the hood and the front bumper." What are you waiting for? Get and instant offer now! The Clunker Junker is one of the top junk car buyers in the state of Pennsylvania. To date we have made instant offers on over 20 thousand vehicles across the state, totaling over $5.6 Million offered! Of those vehicles, approximately 8% were purchased without a title. We also buy cars on a wide spectrum of conditions and 51% of the vehicles we've made offers on in Pennsylvania do not start or drive. Many also have moderate to severe body damage. Philadelphia in Cass County was our top producer, followed by Lancaster.